4 Bdrm Top flr Penthouse flat. Hall. Lounge/Dining rm. Dining kitch. Bdrm with ensuite. Bathrm. Upper flr: 3 Bdrms 1 with ensuite. Cloakrm with wc (CT band - TBC). Parking. Price over £285,000 Entry by arr. Viewing contact solicitors. Below Home Report Valuation (EPC band - C). 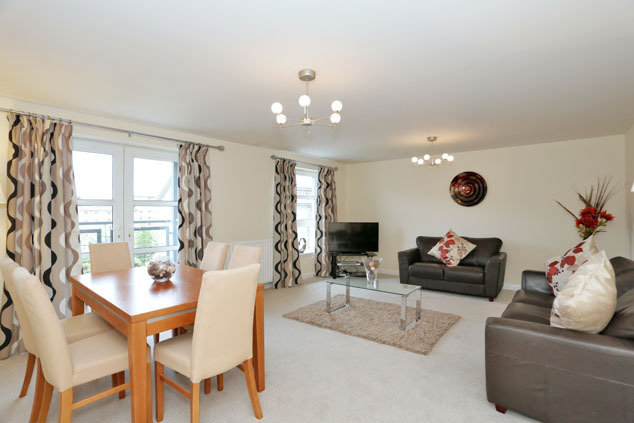 Enjoying a great location within the popular Bannermill development close to Aberdeen’s beach boulevard, this four bedroomed penthouse apartment with dining kitchen and exclusive parking offers an exceptionally generous level of accommodation over two floors. 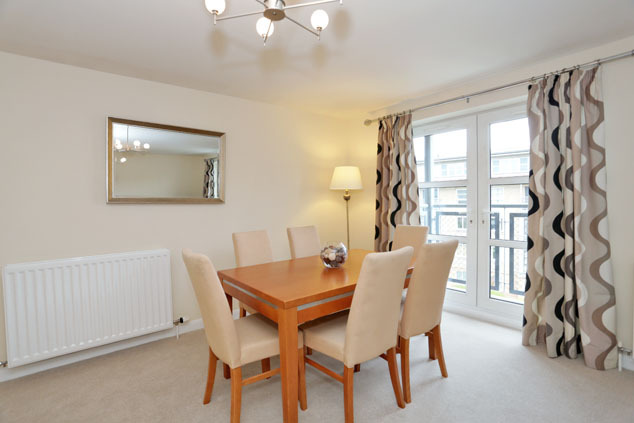 Beautifully presented with fresh neutral décor and newly laid carpeting completed in June 2015, the subjects are truly ready-to-move into and benefit from quality double glazing, gas fired central heating and the communal areas are protected by a security entry system and are maintained under a factoring contract. Upon entering there is a lovely welcoming hallway with built-in storage and an attractive staircase rises to the upper floor. 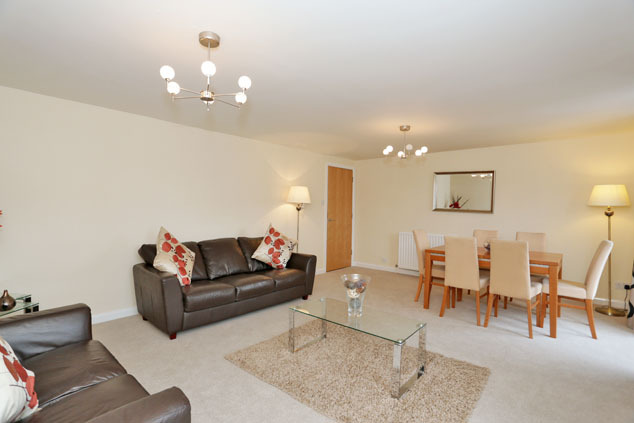 There is a superb lounge/dining room with French doors to a Juliette balcony, a quality fitted comprehensively equipped dining kitchen, a double bedroom with quality en suite and a further bathroom with shower. 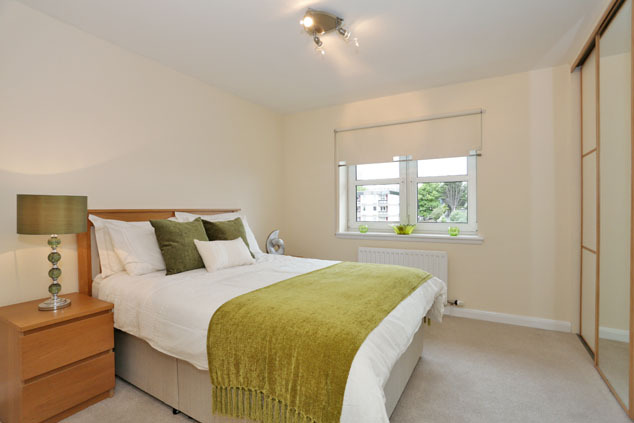 The upper floor provides a sumptuous master suite with two walk-in wardrobes and a spacious en suite shower room, there are two further double bedrooms and a useful cloakroom. Outside, the communal areas have well stocked shrubbery beds and from constitution street is a secure barrier system giving access to the secure exclusive undercover parking space. 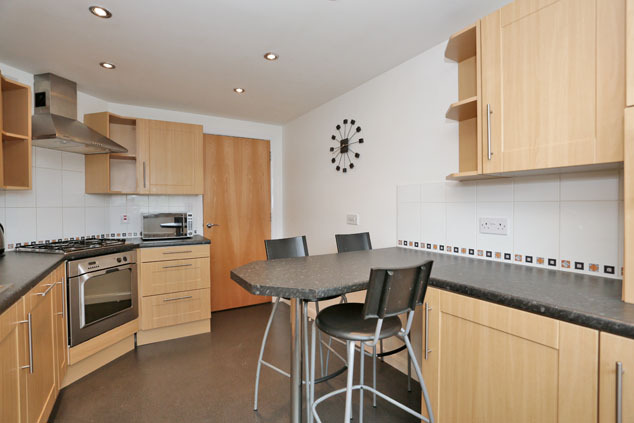 This is a superb apartment of which internal inspection is highly recommended to appreciate the quality of finish and fantastic level of accommodation within. 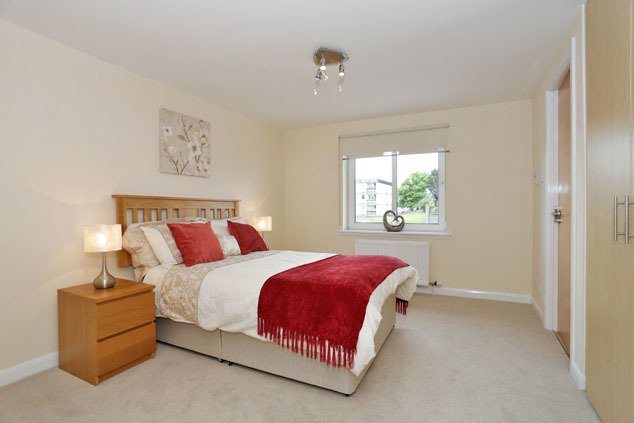 Bannermill enjoys a lovely coastal location close to Aberdeen’s beach boulevard with its walks, recreational facilities and shopping centre. 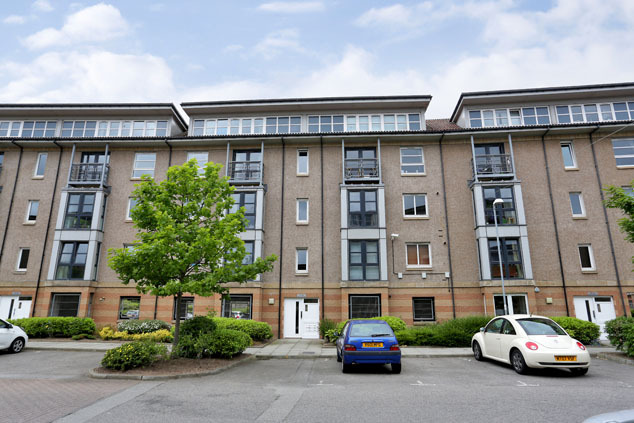 Enjoying easy access to Union Street, Aberdeen's main thoroughfare, regular public transport is readily available and the subjects are also well placed for Aberdeen University and the Aberdeen Sports Village and Aquatic Centre. Communal Hall The communal hallways are well presented, neat and tidy and have windows drawing in great natural light. There is electric lighting and a communal security entry system. Hall 13’8” x 7’6” [4.19m x 2.30m] approx. 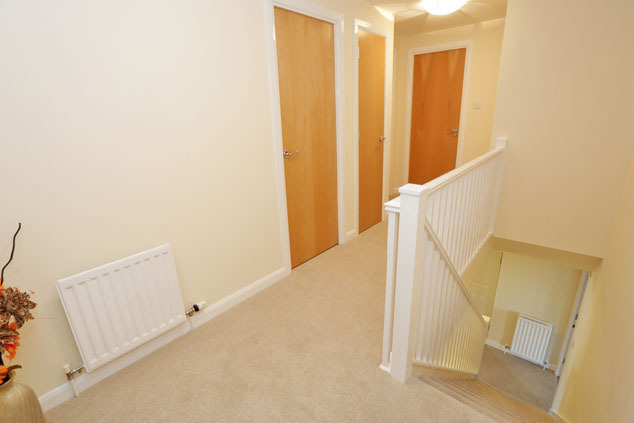 With fresh neutral décor and recently laid co-ordinating carpeting setting the decorative theme for the accommodation, an attractive carpeted staircase with balustrade rises to the upper floor. Lovely wooden doors with chrome handles give access to the accommodation and to a deep walk-in cupboard which provides excellent storage. 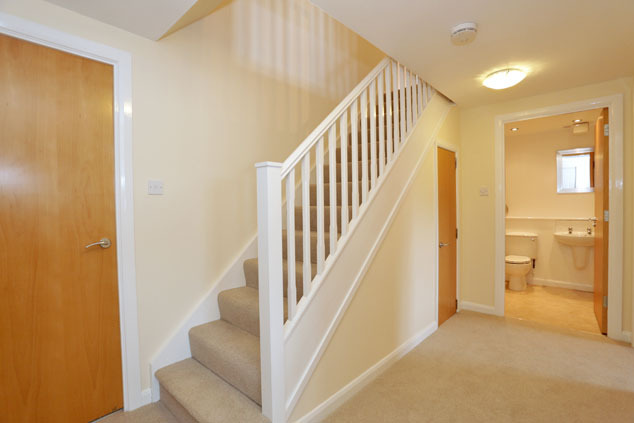 There is a further understair cupboard, smoke detector and two ceiling light fittings. Lounge/Dining Room 19’8” x 15’2” [6.01m x 4.64m] approx. 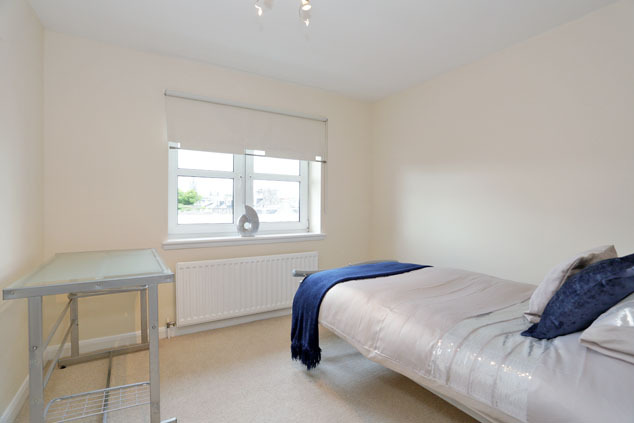 As can be seen by the dimensions, this is a generously proportioned room which has ample space for soft furnishings and for a dining table and chairs as required. With neutral décor and co-ordinating carpeting, there are two contemporary central light fittings, a window overlooks the front and double French doors open out to the Juliette balcony. Dining Kitchen 12’11” x 8’9” [3.95m x 2.67m] approx. Fitted with an excellent range of light wood style wall and base units incorporating nickel rod handles, display shelving, drawer units and dark contrasting worktops with splashback tiling and a co-ordinating dining bar. 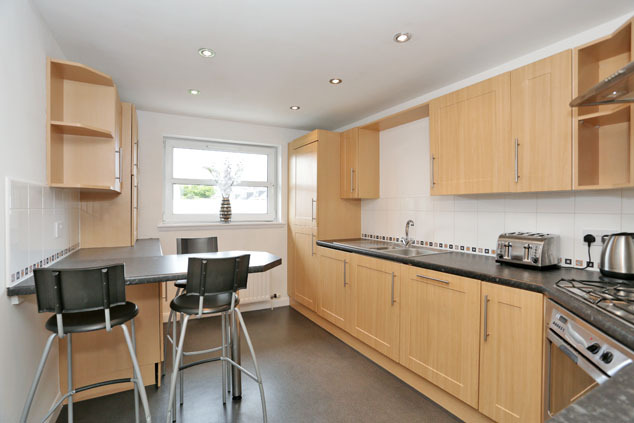 There is a stainless steel sink with drainer and mixer tap and integrated appliances include a stainless steel fan assisted oven, four ring gas hob and this has a stainless steel chimney extractor hood above. There is an integrated automatic washing machine, dishwasher, fridge and freezer. With fresh neutral décor and dark contrasting vinyl flooring, a window enjoys a pleasant outlook to the rear and the room has ceiling downlighters. The gas fired central heating boiler is located within one of the units. Bedroom 2 13’0” x 10’3” [3.97m x 3.14m] approx. 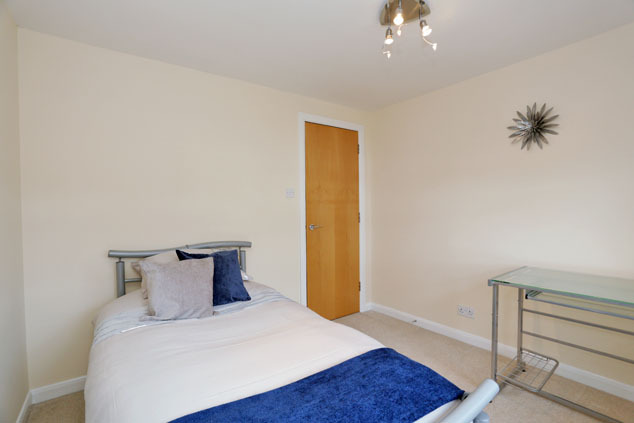 Well proportioned, this double bedroom overlooks the rear, has neutral décor and carpeting and excellent storage is provided by the built-in double wardrobe which has attractive wooden doors. Door to: En Suite 8’0” x 4’11” [2.45m x 1.50m] approx. 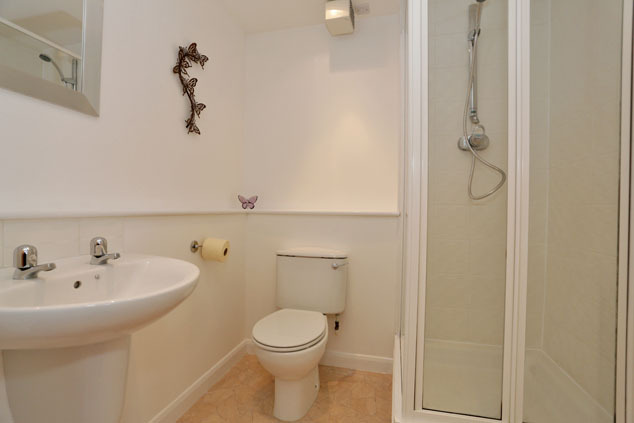 Quality fitted with a w.c. and wall hung wash hand basin, there is a shower unit with bi-folding glazed doors, mains thermostatic shower and extensive tiling to the shower area. There is an opaque window to the rear and the room is decorated in white fresh tones with co-ordinating vinyl flooring. There is a wall mounted folding mirror and shaver point, while the chrome fittings will remain. Air extractor. Bathroom 7’6” x 6’3” [2.30m x 1.91m] approx. 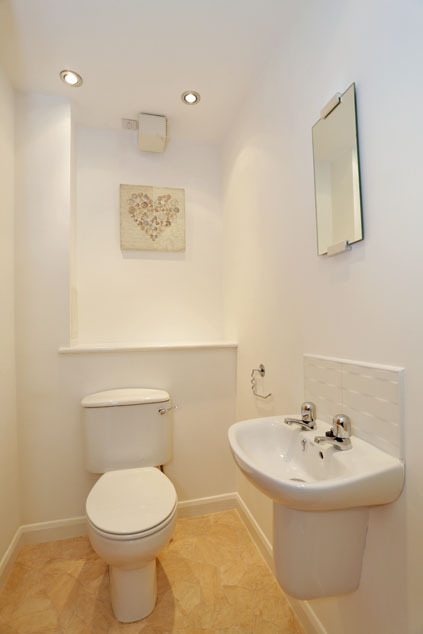 Fitted with a white suite comprising of a bath, w.c. and wall hung wash hand basin. There is an excellent shower over the bath with a glazed shower screen and extensive tiling to the shower area which continues to splashback. There is a deep display sill, ceiling downlighters and an air extractor. Fresh white decor and vinyl flooring. Upper Hall 16’0” x 7’0” [4.88m x 2.14m] approx. 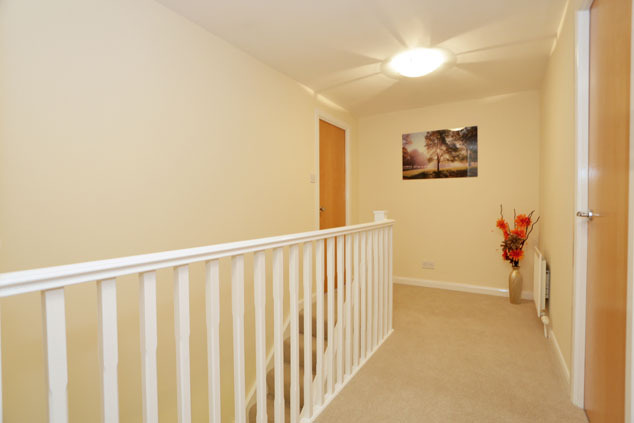 A spacious upper hallway with an attractive galleried landing created by the white balustrade. 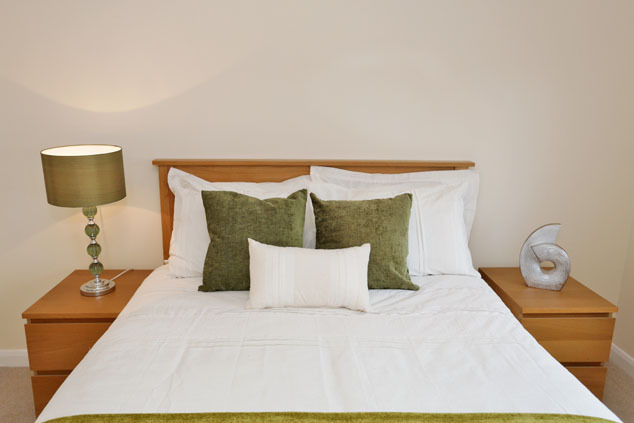 The fresh neutral décor and newly laid quality carpeting follows up to the hallway which has a smoke detector, two ceiling light fittings and a built-in cupboard housing the large hot water tank. Master Bedroom 16’1” x 11’7” [4.90mx 3.55m] approx. A sumptuous master bedroom with a panoramic multi pane window to the front affording great natural light to the room which again enjoys neutral décor and carpeting. 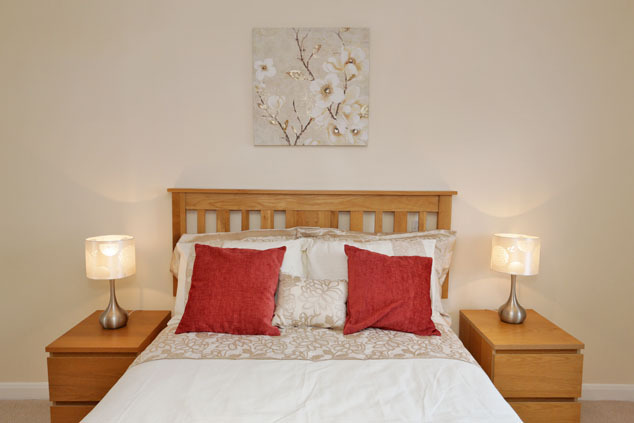 There is a halogen track spotlight fitting and ample space for free standing bedroom furniture. 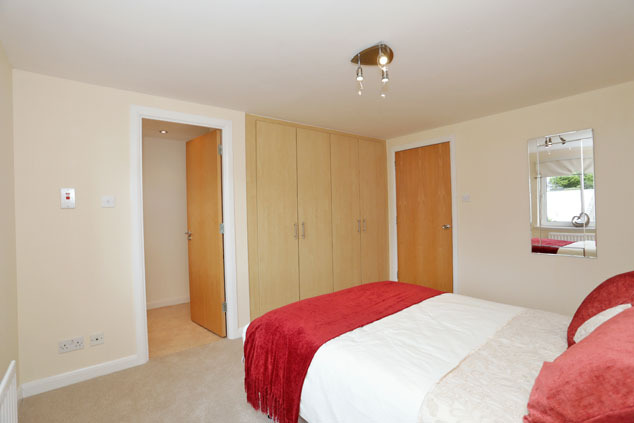 There are two walk-in wardrobes (5’11” x 4’8” [1.82m x 1.44m] approx. ), both having shelving, hanging rails and lighting. Door to: En Suite 9’1” x 6’4” [2.77m x 1.94m] approx. 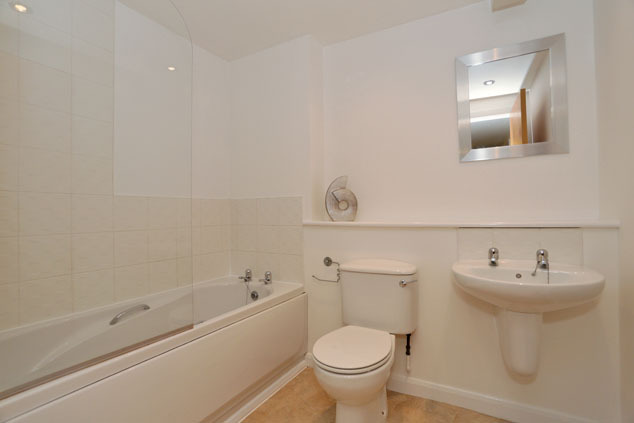 The bathroom is fitted with a w.c., wall hung wash hand basin and a shower unit with glazed doors, extensive tiling and mains thermostatic shower. There is a deep display sill, air extractor, downlighters and fresh white décor with vinyl flooring. Shaver point and chrome fittings to remain. Bedroom 3 10’9” x 10’0” [3.28m x 3.05m] approx. 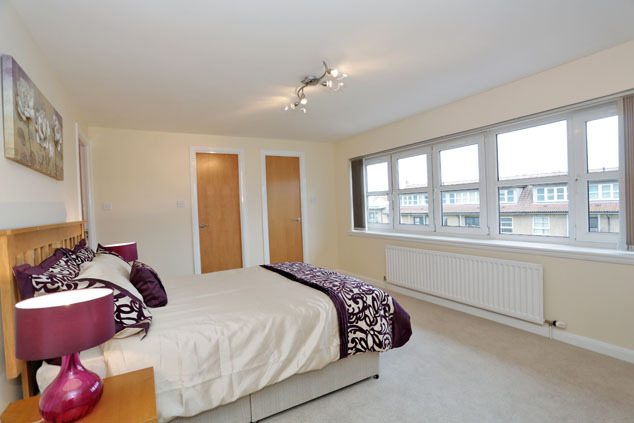 A good sized double bedroom which overlooks the rear and has neutral décor and carpeting. 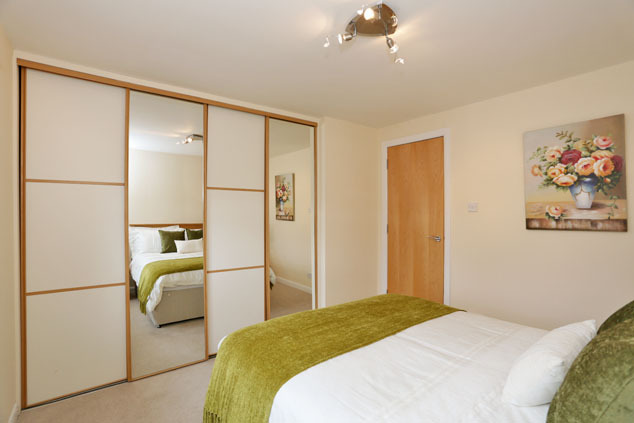 Excellent floor-to-ceiling storage is provided by the built-in wardrobes which have contemporary wooden/cream sliding doors. Bedroom 4 9’10” x 9’2” [3.00m x 2.81m] approx. Again with neutral décor and carpeting and overlooking the rear. Halogen spotlight cluster. Cloakroom 5’11” x 3’10” [1.83m x 1.17m] approx. 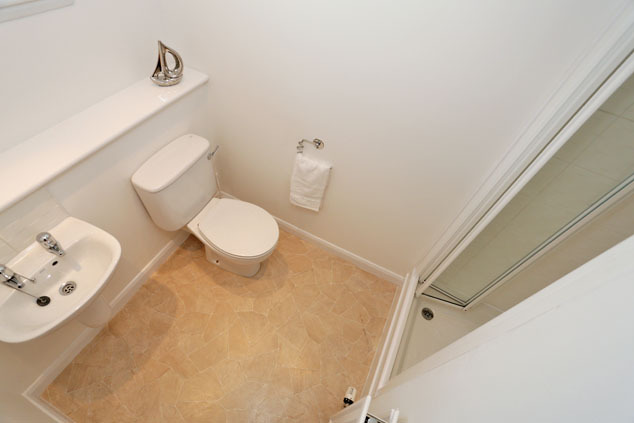 This useful cloakroom is fitted with a w.c. and wall hung wash hand basin. There is a display sill, white fresh décor and vinyl flooring. Ceiling downlighters and air extractor. Outside The external gardens are maintained under a factoring contract and laid with mature shrubbery beds and attractive paid seating areas. There is a numbered secure exclusive undercover parking space and ample visitors’ parking. Notes Gas fired central heating. Quality double glazing. EPC=C. Communal security entry system. All fitted floor coverings, curtains, blinds and light fittings and integrated kitchen appliances are included in the sale. Further large items of furniture may be made available upon request. 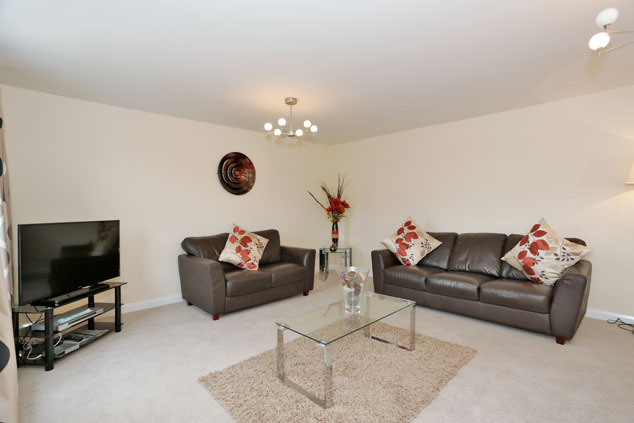 A factor has been appointed for the upkeep of the internal and external communal areas for which a fee of approximately £62 pcm is payable.